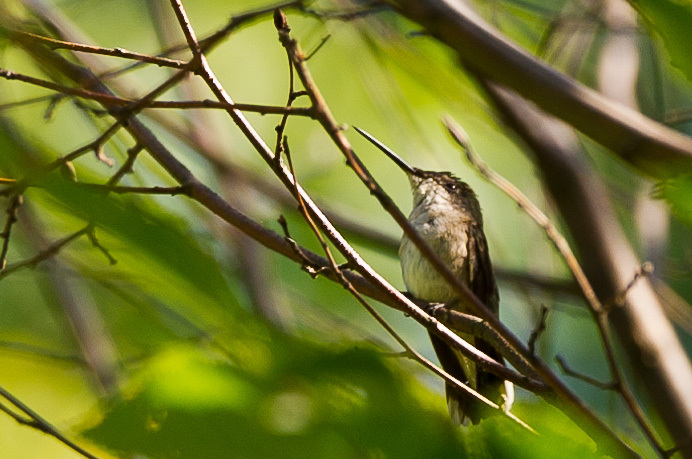 The hummingbirds have been elusive the past few days. As I took up my spot between the deck and the feeder to catch some of the action, the birds that had been fighting over the feeder moved to an adjacent tree. There they perched, observing me down below as I sat quietly in the grass. The stand-off lasted close to 15 minutes as we watched one another. They were incredibly patient, flying around the yard from tree to tree, but never hovering over the feeder. Finally, my arms grew tired of holding the camera, and I gave in. I swiveled around to catch them in the tree above me before I returned to the house, and they eyed me, with what I felt was a gloating look. By the time I’d returned to the top of the deck stairs, they were back at the feeder. I was just a distant annoyance. LOL – Great photo! They are so cute, but certainly know how to frustrate photographers!